The Seaba Station, formerly known as Seaba’s Filling Station and Seaba Engine Rebuilding and Machine Shop, offers travelers an example of an early rural service station along historic Route 66. It also tells the story of commercial adaptation along the ever-changing Mother Road. In 1921, John Seaba constructed the filling station near Warwick along State Highway 7, which was part of the old Ozark Trails network. This already established thoroughfare was simply re-designated U.S. Highway 66 in 1926. Now flanked by later additions to the north and south, the original irregular shaped red polychrome brick station had a five-sided open service bay. The gas pumps, which dispensed the cheerfully optimistic “NevrNox” brand, were located in the central bay. 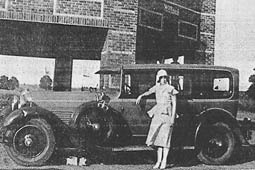 Although called a filling station, its additional auto repair function illustrates the growing trend in the 1920s toward full service stations. Brick and metal windows filled in the open service bays in the 1940s, but visitors today can easily see the original brick columns that supported them. Light brick rectangles decorate both the columns and the areas above the bays. A crenulated parapet capped with white brick rims the flat roof. Directly behind the bay area is a detached red brick workshop with a gabled roof, also constructed in 1921. Here Mr. Seaba began to diversify. Initially he purchased and reassembled Model T Fords. In 1934, he opened an engine repair shop, specializing in rebuilding connecting rods. As traffic--and breakdowns--increased along the Mother Road, the station flourished and by the late 1930s employed about 18 people. The coming of World War II and its strict gas rationing sealed the fate of the filling station. Boosted by government contracts to repair the military trucks plying Route 66, Seaba filled in the bay areas and converted to full-time engine rebuilding. The building served this purpose until 1994. In the early 1990s, new owners reopened the station as an antique, gift, and tourist stop along historic Route 66. The owners received a NPS Route 66 Corridor Preservation Program Cost-Share Grant in 2005. In 2008, three of the original five bays were re-opened to evoke the station’s 1921 appearance. Sold in 2007, the building continued to be remodeled for yet another purpose. Reopened in the summer of 2010, the Seaba Station is now home to a motorcycle museum. The Seaba Station is especially noteworthy for the restored, original rock outhouse building, which is a state-of-the-art roadside restroom from the 1920s. Amenities included his and hers cast iron toilets, which conveniently flushed the entire time individuals sat on the rims of the toilets. 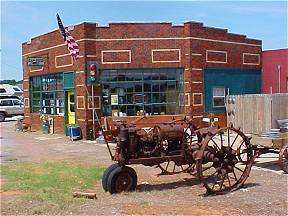 The Seaba Station is located on the north side of Route 66 eight miles west of Chandler, OK near the community of Warwick. It is also one mile east of Highway 177. The station is currently open Monday, Tuesday, Thursday from 10:00am to 5:00pm, and Friday to Sunday from 10:00am to 6:00pm. For more information call 405-258-9141 or visit their website.